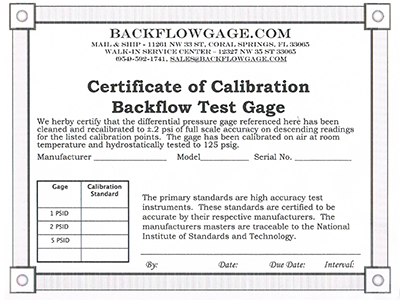 Backflowgage.com will calibrate your test gage to the original manufacturers specifications with high accuracy test equipment traceable to the National Institute of Standards and Technology for Annual Calibration Service for Backflow Test Gauge. Not just our own gage, we can calibrate ANY manufacturers gage. 1-2 day turn around if repairs not required. We will notify you of any repair work before proceeding. Your credit card will be charged the additional amount to return your unit by FedEx Ground Shipping when calibration is completed. Do not include the case or hoses in the shipment. PLEASE NOTE: When shipping the gage to be calibrated, if you send us a prepaid shipping label to allow us to send the gage back to you after calibration, it will speed up the transaction immensely. In most instances the turn-around-time to get it shipped back will be the same day. Please also do not send the hoses or carrying case. They only make the package larger and are not necessary for calibration. * Please do not request a signature for delivery.